Initially I left the sea salt on top and drank the coffee and cream separately. After a couple of sips, I carefully swirled the two parts together. Ultimately, the drink is just interesting for its uniqueness. * Otherwise there's nothing particularly amazing about the coffee. Similarly, I enjoyed the egg tart, but it wasn't amazing. With that being said, the crust had a nice soft, flaky texture, and for $1.50 I suppose I'd get it again. I should, however, note that the only reason I got the egg tart was because my friend wanted to buy something for dessert and the restaurant we just came from, Capital Seafood Restaurant, had run out of them. Possibly a blessing in disguise, I later read that the egg tarts at Capital Seafood did not have the nice flaky crust expected of an egg tart. 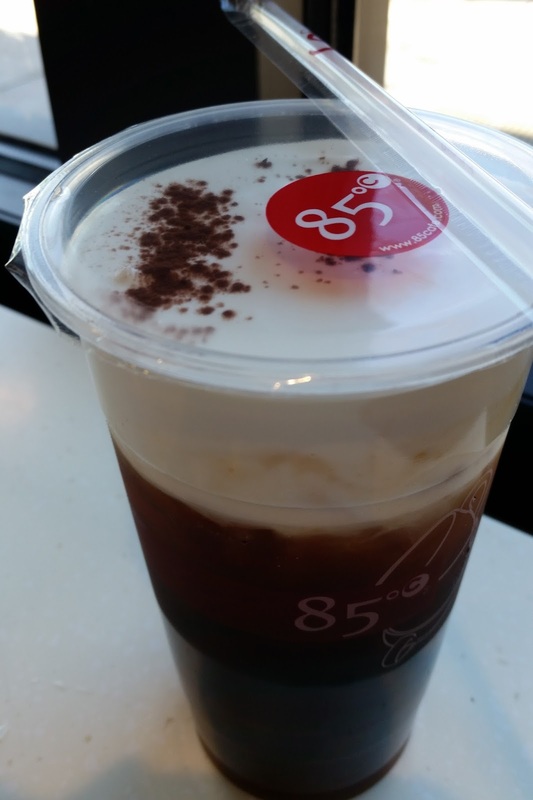 *That is, until 7 Leaves Cafe opened where you can get a sea cream black coffee. So last year an 85°C Bakery Cafe opened in Berkeley and this is my second time coming to it. One interesting note is that the location lacks extremely long lines. I would attribute this either to the audience - college students - or the selection of food. 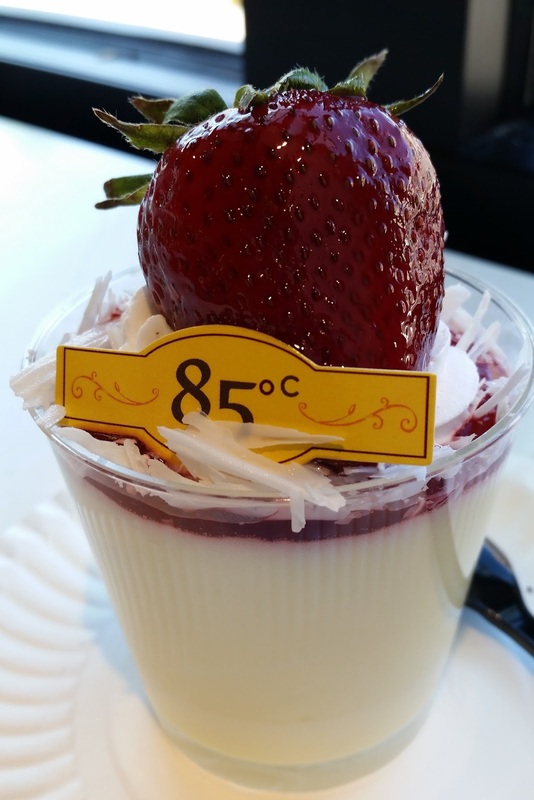 In any case, I got some sort of strawberry-based dessert which primarily tasted like the same strawberry syrup found swirled in the strawberry sundae ice cream cups (the ones you eat with a wooden spood out of a plastic cup). In addition to the strawberry syrup, there was also a subtle white chocolate flavor and some moist sponge cake sitting in the center. Oh, and to my surprise, I could also taste what seemed to be a pineapple syrup in parts of the sponge cake. Overall, it was delicious. 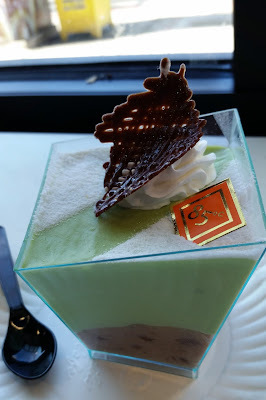 My friend, however, got a less exciting green matcha red bean dessert. For the most part, it only lightly tasted like matcha and the red bean wasn't so sweet. With that being said, mixing the layers of the cup did seem to help improve the taste. 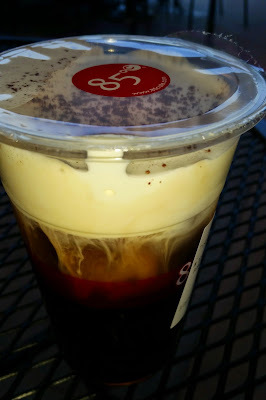 And last, but not least, I had the iced sea salt coffee which comes in two layers: the coffee on bottom and the sea cream on top. Failing to realize this, I poked the top open with my straw and took a sip of plain coffee. As such, I carefully swirled the coffee around and let the cream mix into it. Interestingly, the mixture is a suspension and not a solution; after some time the two layers will separate. Note I find the sea cream has a creamy, soft consistency as opposed to whipped cream (e.g., at Starbuck's) which has a thick, heavy consistency. *Everybody I know refers to it as "85 Degrees."